A press conference on Aug. 24 announced the grant. St. Scholastica has been awarded $2.76 million by the U.S. Department of Health and Human Services - the largest grant in the College's 107-year history. This announcement was made during a press conference on Friday, Aug. 24, and covered by local media outlets including the Duluth News Tribune, Business North, WDIO-TV Channel 10, KBJR-TV Channel 6, and FOX-TV Channel 21. 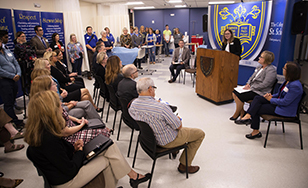 "This four-year federal investment in our School of Nursing will fund the Rural Registered Nurses in Primary Care project," said President Colette Geary, "enabling St. Scholastica to advance its leadership role in addressing the critical RN primary care workforce shortages in rural and underserved communities. It will also strengthen our longstanding academic and clinical partnership with Essentia Health." RNs practicing in primary care are key to addressing poor health outcomes by providing long-term preventative care, particularly given the shortage of advanced practice nurses and physicians in rural Minnesota. However, Minnesota nurses are heavily skewed toward acute care rather than primary care. Essentia Health regularly reports numerous unfilled positions in primary care throughout their service area. Through the RRNPC project, St. Scholastica Nursing students will gain primary care competencies in theory, in skills training and simulation, and in real-world clinical experiences. They will participate in multiple shifts in primary care settings. Instructors at Essentia clinics and sites throughout the region will provide mentoring. President Geary noted that St. Scholastica is the only recipient of a grant of this type in the state of Minnesota. Of the 42 grants awarded nationwide, only three other recipients are in the Upper Midwest (Iowa, Nebraska, and South Dakota). Dr. David Herman, CEO of Essentia Health in Duluth, said the RRNPC project builds upon a close, symbiotic partnership. "This is the latest development in a fruitful relationship between our institutions that goes back more than a century, to the founding of St. Mary's Medical Center in Duluth," Herman said. "It is an outstanding addition to that long-standing partnership. The RRNPC project will, over its four years, provide Essentia Health with a better-prepared Registered Nurse workforce. Our current and future nurses will gain expertise in primary care, particularly ambulatory or ‘walk-in' care. The genius of this project is that, not only will there be stronger preparation for undergraduate nurses in training, but for current nurses there will be continuing education and orientation, resulting in increased proficiency and satisfaction in the important work they do in caring for patients. "Congratulations to The College of St. Scholastica, whose School of Nursing is once again showing visionary leadership. We at Essentia Health are proud to expand our strong partnership with the College through this innovative project to improve primary care in the Northland and across the nation." Dr. Sheryl Sandahl, interim dean of the School of Nursing, said the faculty and students are eager to launch the RRNPC project. "This project is all about expanding the RN role in primary care," Sandahl said. "To help address the primary care provider shortage, we need RNs to work at the top of their licensure. This will allow them to become more valuable contributors to preventive health care and care coordination, as well as the management of patient transitions between levels or locations of care. This is where we need to concentrate; this is where patients are in need." The College of St. Scholastica School of Nursing enrolls more than 1,000 students per year and is the second largest nursing program in the state. St. Scholastica is the only college in northeastern Minnesota that offers undergraduate and doctoral programs that are accredited by the Commission on Collegiate Nursing Education (CCNE), and is listed by the Minnesota Board of Nursing as a CEU-granting entity. The College has received numerous major federal grants to support the development of innovative programs through the School of Nursing. "The federal government's support of the College is evidence of our strong record of accomplishment and academic standards of excellence," Geary said. "I would like to express my gratitude to the U.S. Department of Health and Human Services, whose support is crucial as we explore new models to more effectively secure and enhance the health of our region's residents, particularly those in rural and underserved settings." The College of St. Scholastica's dedication to improving rural health is also shown by federal and state grants received to support rural veterans in nursing, clinical social workers and nurse practitioners in rural communities, and placing Physician Assistant students in rural settings. "All these initiatives reflect our strong and enduring commitment to addressing the needs of rural communities," Geary said. This project is supported by the Health Resources and Services Administration (HRSA) of the U.S. Department of Health and Human Services (HHS) under grant number UK1HP31712 Nurse, Education, Practice, Quality and Retention Registered Nurses in Primary Care for $2,761,681. This information or content and conclusions are those of the author and should not be construed as the official position or policy of, nor should any endorsements be inferred by HRSA, HHS or the U.S. Government.